View Yarra River Basin in a larger map (opens new window). 45 ha. Melway Ref: 57 J 4. Non-powered boats, picnic and recreation facilities. The management of Albert Park Lake was transferred to Parks Victoria in the mid 1990s. Recreational activities such as fishing are currently being reviewed by Parks Victoria for the Albert Park Lake Future Directions Plan. In 1999 and 2000, golden perch were stocked in the hope that they would better survive the high summer water temperatures in the lake. At this stage, to minimise conflict with other users, fishing was restricted to several small 'fishing zones' which were considered insufficient to warrant further stocking. Other species present include yabbies, redfin, roach and European carp. Small creek 3 m wide upstream to 6 m wide downstream, rubble substrate. Has riffles 10-20 cm deep and pools to 80 cm. Excellent instream habitat. There is an onstream diversion dam which diverts water into the Melbourne supply system. There is no fishing upstream of this dam. Contains numerous small brown trout, river blackfish, abundant pouch lamprey and short-finned eels. Flows in forest, and then through Healesville Sanctuary. Creek is 5 m wide with water depth in the riffles of 10-15 cm and pools to 100 cm. Rubble substrate and excellent fish habitat. There is no fishing upstream of an onstream diversion dam. Recent River Health Program activities have been bed and bank stabilization and works to enhance fish movement through the area. Most numerous fish are small river blackfish, small brown trout and roach. Other species are short-finned eel, goldfish, mountain galaxias, shorthead lamprey, pouch lamprey, southern pygmy perch, redfin, Australian smelt and the occasional trout galaxias and climbing galaxias. Small creek, 6 m wide, with predominantly shallow riffles 20-40 cm deep and pools to 50 cm. Rubble and sand substrate. Flows through forest and has a reliable summer flow and excellent habitat. Good access in the lower section. Contains small brown trout and river blackfish to 200 g and small spiny crayfish. 1 ha. Picnic area & playground. Melway Ref: 75 G12. A small lake set in parkland and managed by the Shire of Yarra Ranges. Fish present are roach to 200 g, European carp to 3 kg and short-finned eel to 2.5 kg. 2 ha. Picnic facilities, open space, bush walks. Melway Ref: 48 B 11. A shallow lake located in 17 ha of bushland and managed by the City of Whitehorse. It contains European carp and redfin, most of which were removed in January 2001 by electrofishing. Has water quality problems. Fishing is prohibited. Anglers liable to prosecution. A small creek with poor access being largely overgrown with introduced shrubs and blackberry. A fish survey found brown trout to 300 g, river blackfish to 38 g, short-finned eel to 108 g, rainbow trout to 80 g, mountain galaxias and small spiny crayfish. Not recommended as a fishing water. Family Fishing Lake, No facilities. Melway Ref: 68 E2. A small artificial lake in the center of the Caulfield Racecourse and managed by the Victoria Amateur Turf Club. Parking inside the course. Access is available from 9am to 5pm except on race days. Enter by gate 22 on Station Road or Gate 9 on Kambrook Road. Within easy walking distance of Caulfield Station. Managed as a Family Fishing Lake and subject to stocking with advanced yearling rainbow trout (See Introduction). A rock-ramp fishway on Merri Creek on which Coburg Lake is situated has been constructed. A small ornamental lake on Merri Creek near the old Pentridge Prison. Turbid water, and overflows in heavy rains. Unsuitable for trout stocking. Contains short-finned eel, redfin, roach and European carp. A small tributary of the Woori Yallock Creek. Mostly shallow riffles with some pools to 150 cm deep, sand substrate. Most of the lower reaches flow through the Yellingbo State Nature Reserve, and restrictions on fishing apply (see details in Woori Yallock Creek). Contains some small brown trout, river blackfish to 280 g, roach to 300 g, small spiny freshwater crayfish, shorthead lamprey ammocoetes, southern pygmy perch, and mountain galaxias. A small creek which together with a number of tributaries, including Arthurs Creek, rises west of Kinglake and flows for 40 km through Eltham to the Yarra River. Channel width is 4 m upstream to 8 m in the lower reaches. Pools vary from 100+ cm upstream, to 200+ cm downstream. Gravel and rubble substrate. Upstream of Hurstbridge, it dries to a series of pools during summer. Downstream, it flows all year with better quality fish habitat downstream of Diamond Creek. Has areas with steep banks to 6 m, and is unsuitable for wading. Extensive deep pools from Eltham to near the mouth of the creek at the junction with the Yarra River. Contains some brown trout to 330 g, redfin, short-finned eel, river blackfish, roach and European carp. Other species recorded in the creek are goldfish, mountain galaxias, southern pygmy perch, Australian smelt, and climbing galaxias. It provides some good fishing for those with local knowledge. There has been extensive removal of willows and weeds and replanting with native species as part of the River Health Program. Popular baits are garden worms and crickets for trout and bread dough for roach. Golden perch have been reported to be caught in the creek near the Yarra River. 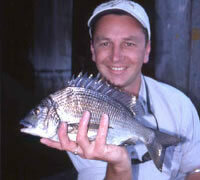 Stocked near the Yarra River junction in 1999 with Macquarie perch by Native Fish Australia. Not usually stocked because of the movement of fish into the creek from the Yarra River. Managed by the Shire of Yarra Ranges.Access through the Showgrounds in Don Road on days other than when a major event involving fee admission is occurring. Bank fishing only. Contains redfin to 1 kg and goldfish. Stocked occasionally during the cooler months of the year for special events. Recent decision to manage as a Family Fishing Lake. A small creek (2-3 m wide) with predominantly fast, shallow water, 10-30 cm deep, gravel substrate. This is an important spawning and nursery area for brown trout from the Yarra River. It has abundant brown trout to 275 g, river blackfish to 200 g, roach and short-finned eels. Other species recorded are mountain galaxias, and the introduced oriental weatherloach. The creek is seldom fished by the serious angler. An artificial lake on Edgars Creek, a tributary of Merri Creek. Managed by Darebin City Council. Prone to sedimentation. There were several attempts in the early 1980s to develop a trout fishery but this ceased because of unacceptable levels of water pollution (PCBs). Contains mainly European carp, and some roach, redfin and goldfish. Serious issues have been highlighted regarding water quality. As a result, fishing here is prohibited by order of Darebin City Council. Family Fishing Lake, 1.3 ha. Picnic facilities, toilets, kiosk. Melway Ref: 127 J4. An ornamental lake on Wattle Creek, (a tributary of Cockatoo Creek), managed by Cardinia Shire Council. Contains redfin, roach, goldfish, rainbow trout to 1 kg and some brown trout to 2 kg. Fish are usually in good condition. Access is good but an entrance fee is charged. Managed as a Family Fishing Lake and subject to stocking with advanced yearling rainbow trout (See Introduction). Joins the Watts River at Healesville, gravel and rubble substrate. Average width 2 m, shallow riffles 3-10 cm, pools to 50 cm, good habitat. 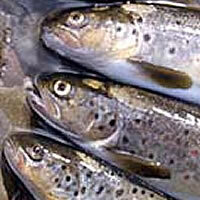 Contains brown trout to 350 g, short-finned eels to 600 g, some river blackfish, and small redfin. 4 ha. Family Fishing Lake, Picnic facilities and toilets. Melway Ref: 7 B11. Small lake surrounded by open recreational area and good bank access. Contains good-sized redfin and European carp which can be caught on earthworms and bread dough. Managed as a Family Fishing Lake and subject to stocking with advanced yearling rainbow trout (See Introduction). 27 ha. Toilets, picnic facilities, playground, non-powered boating. Managed by the Shire of Yarra Ranges, this shallow (2 to 2.5 m water depth) basin is located on Olinda Creek, south of Lilydale. Access is from the Lilydale/ Montrose Road. Facilities include ample parking, toilets, electric BBQs, picnic shelters, a large modern playground and a liberty swing (for disabled access). No fishing is permitted in the beach area but most of the shoreline is accessible to anglers, providing extensive fishing opportunities. There are also two fully accessible fishing platforms located near the Olinda Creek inlet and at the western end of the lake. Lillydale Lake is managed as a Family Fishing Lake and subject to stocking with advanced yearling rainbow trout. The lake also contains European carp, redfin, roach, tench and short-finned eel. All popular fishing methods including bait, lure and fly are successful. A minimum environmental flow must be maintained in Olinda Creek below the Lake and fishing in this section of the creek occasionally produces some good results. Width 6 m, extensive areas with water 50-80 cm deep, sand substrate with small patches of rubble/gravel in riffles. Banks 1-2 m high. Good summer flow and patches of good instream habitat (bank cover and debris). River Health Program works have included removal of willows and placing instream logs as fish habitat. Contains abundant brown trout av. 100 g, (max. 600 g), some small rainbow trout, river blackfish, short-finned eel and roach. Also some mountain galaxias, shorthead lamprey, pouch lamprey, southern pygmy perch and possibly Australian smelt. Not stocked since 1958. Tributary of the Yarra River. Fish present are short-finned eel, river blackfish to 80 g, small redfin and roach. 197 ha. 28,600 ML. Excellent picnic facilities and passive recreation. No swimming or boating. A small creek 4 m wide, flowing through open forest. Riffles 20-30 cm deep and pools to 85 cm. Sand substrate in the pools and rubble in the riffles. Excellent aquatic habitat. There is a diversion dam for urban supply and no fishing is permitted upstream of the dam. Departmental fish surveys found numerous small river blackfish, short-finned eel and brown trout. Flows into the Watts River downstream of Maroondah Reservoir. Contains small brown trout to 200 g in the lower reaches, short-finned eel, small redfin and river blackfish. Last stocked with trout in 1959. Coolant water discharge channel to Port Phillip Bay (at the mouth of the Yarra River) from gas-turbine power generating station. Fish present in the channel are usually black bream, yellow eye mullet, sea mullet, silver trevally, tailor, occasional mulloway and some good-sized 'pinky' snapper. Fishing results depend on water conditions with best catches when the station is operating and there is a flow of warm water, which attracts fish into the channel. Small stream flowing from the Dandenong Ranges to join the Yarra River below Yarra Glen. Silvan Reservoir and Lillydale Lake are located on the creek. Between the two storage's, the creek contains small spiny crayfish, some brown trout to 250 g, and short-finned eels to 450 g. River Health works have been to restore bed and bank stability and control willows and weeds. There has been a major program of replanting with native species around Lilydale. Downstream of Lillydale Lake there are roach (av. 100 g), short-finned eel, some brown trout and redfin. This section of the creek produces good fishing results but observe the 'no entry signs'. Last stocked with trout in 1952. Upper reaches and catchment above O'Shannassy Reservoir (water storage Melbourne urban supply) closed to fishing. The river downstream is 6 m wide with riffles to 20 cm and most pools less than 40 cm deep. It has a boulder substrate and provides little habitat for larger fish. Not surveyed but contains small brown trout. Not worth fishing. A locked gate prevents vehicle access upstream from the junction of the Yarra River. Rises in the Great Dividing Range north of Whittlesea and flows south through flat farmland, a river gorge, then suburban Melbourne to the Yarra River. The river and catchment area above Toorourong Reservoir (Melbourne Water urban supply) is closed to the public. Water is also diverted into Yan Yean Reservoir (Melbourne Water urban supply) downstream of Whittlesea. Flow downstream of the reservoirs is regulated by Melbourne Water. Has a low summer flow, high water temperature and some pollution which results in occasional fish deaths in the lower reaches. The creek is small upstream of Whittlesea and often stops flowing during summer although there is some permanent water in pools 80-100 cm deep. The section of river from Whittlesea to South Morang is up to 5 m wide with pools to 100+ cm deep. It has some areas of good instream habitat but summer flow can be low or cease. Access is mostly through private property. The river flows through steep terrain at the gorge area at South Morang. There is no wading but access along the gorge is possible. There are extensive pools to 150+ cm deep. Flow can cease during summer but the pools hold water and maintain permanent habitat. Access from here downstream to Greensborough is difficult because most of the creek is in a Melbourne Parks and Waters Conservation Area. There is some good instream habitat around Greensborough although the banks are steep with extensive introduced and native riparian vegetation. Channel width is 10 m with mostly pools to 100+ cm, with sand substrate, and rubble in some riffles. The lower reaches usually have some flow all year. River Health Program works have involved substantial removal of willows and other exotics and replanting with natives as well as stabilizing bed and banks and adding logs and other fish habitat. Fish present downstream from Toorourong Reservoir are short-finned eel, common galaxias, mountain galaxias and southern pygmy perch. The west branch also contains goldfish, redfin and eastern gambusia. In addition the lower reaches contain roach, European carp, flathead gudgeon, oriental weatherloach and occasional brown trout. In recent years, trout galaxias and shorthead lamprey have returned to the river. Last stocked with trout in 1969. The river is not recognised as an angling water but provides some fishing for locals. Less than 1 ha. Excellent recreational facilities. No boating. An ornamental lake located near Maroondah Highway in Ringwood. Water quality has been a problem for fish survival and growth. Contains small redfin, abundant goldfish, roach and European carp to 5 kg. A screen has been installed at the outlet and it was stocked in 1999 with 140 large (20-30 cm) golden perch. It has not been stocked since. 1 ha. Family Fishing Lake, Picnic area and parking at the southern lake. Melway Ref: 179 H8. This consists of three lakes all located in a suburban housing estate and surrounded by small passive recreation areas. They have good access although the southern lake has rushes around 70% of shoreline. Managed as a Family Fishing Lake and subject to stocking with advanced yearling trout (See Introduction). Contains short-finned eel to 400 g, small river blackfish and roach. Water storage managed by Melbourne Water forming part of Melbourne's urban supply. Reservoir and upstream catchment closed to fishing. Flows in State Forest with a parallel road. A small creek (width 4-6 m) with riffles 15-20 cm deep and pools to 40 cm. Rubble substrate with silt on the edge of pools. Good fish habitat. Contains small short-finned eels, river blackfish to 220 g, numerous brown trout to 200 g and spiny crayfish. 400 ha. 95,000 ML. Wading, swimming prohibited. Closed to public boating. A large storage managed by Melbourne Water and filled by pumping from the Yarra River at Yering (Coldstream). Water is treated before transfer to Melbourne. Access to the Saddle Dam Park and fishing area is from the reservoir reserve via the Eltham/Yarra Glen Road. The park is open every day of the year. Gates open at 8.30am and close at 7.00pm during daylight saving. Outside of daylight savings, the park closes at 5.00pm. Contains brown trout to 3.7 kg; (av. 1.4 kg); rainbow trout to 1 kg; European carp to 4 kg; redfin (av.700 g-920 g), roach to 300 g and occasional short-finned eels. Artificial lures or flies only permitted. No natural baits or berley, including bread or corn, is permitted. For most of the area where fishing is permitted, the banks are open with no vegetation. No cleaning of fish in the reservoir. Use fish cleaning facilities and offal bin provided. Note that mercury levels in redfin are above the statutory limit. Stocked with trout until 2000 when Melbourne Water withdrew permission to stock. 24 ha. 7,000 ML. Picnic facilities but no swimming, fishing or boating. Melbourne urban supply reservoir managed by Melbourne Water. Catchment upstream and reservoir is closed to fishing and boating. 750 ha. 206,400 ML. Picnic facilities but no swimming or boating. Melbourne urban supply reservoir managed by Melbourne Water. Catchment upstream including the Yarra River and reservoir is closed to fishing and boating. Receives water from the inflowing upper Yarra River and from Thomson Reservoir via a pipeline. The river upstream of the Maroondah Reservoir is a Melbourne Water catchment area and is closed to fishing. Downstream it flows through forest for 1 km then through farmland and Healesville into the Yarra River. Flow is regulated by releases from Maroondah Reservoir and can be low at times. Accessible at many localities. River width varies from 3-5 m, water depth is 5-30 cm in the riffles and up to 50 cm in pools just below the reservoir increasing to more than 100 cm in the lower reaches. Substrate is rubble below the reservoir and silt further downstream. There has been some removal of willows, replanting with native species and bed and bank stabilization as part of the River Health Program. Fish habitat in the lower reaches is good. Angling fish species include short-finned eel, river blackfish to 1 kg, redfin to 500 g, roach, and brown trout to 1.2 kg. Other species are mountain galaxias, pouch lamprey, oriental weatherloach, shorthead lamprey, southern pygmy perch, and Australian smelt. Fishing is best downstream of Mount St Leonards Road however the banks are steep and the whole area of each pool cannot be easily reached. Successful baits for short-finned eel, river blackfish and redfin are scrubworms drifted on the bottom, and bread dough for roach. This is a good fishing water for river blackfish. Small lake managed by Whittlesea City Council was stocked in the past with rainbow trout for a few special events but this has ceased due to water quality problems. Flows through flat farmland downstream of Yellingbo. Up to 6 m wide with extensive pools 100+ cm deep and riffles 30-40 cm. Clay and sand bottom in pools with patches of gravel in riffles. Has a good summer flow. River Health works include control of willows and weeds, fencing and replanting with native species. Access is good at Maroondah Highway where car parking is available, but much of the creek (particularly in the lower reaches near the Yarra River) can only be reached through private property. Upstream of Yellingbo, the creek flows for 5 km through the Yellingbo Nature Conservation Reserve. The Reserve is an area of riparian forest set aside to protect an endangered bird, the Helmeted Honeyeater, Lichenostomus melanops cassidix, (the Victorian avifaunal emblem). The reserve area is sign-posted and fenced-off and anglers are asked not to enter the reserve along the creek channel. No recreational activities or disturbance of the land or creek are permitted within the reserve. This is the last remaining population of this bird species and must be left undisturbed. Fish present include short-finned eel, river blackfish to 175 g, roach to 150 g, small spiny crayfish and brown trout to 350 g (av. 100 g). Also contains mountain galaxias, Australian smelt, goldfish, European carp, eastern gambusia, southern pygmy perch and shorthead lamprey. Freshwater mussels are common in this creek. 560 ha. 32,900 ML. Picnic area but no swimming or boating. Urban water supply managed by Melbourne Water and closed to fishing. 2 ha. Family Fishing Lake. Picnic area, toilets. Not on Map, Melway Ref: 184 F4. Set in parkland off the Yan Yean Road and controlled by Parks Victoria. Managed as a Family Fishing Lake and subject to stocking with advanced yearling trout (See Introduction). A rock-ramp fishway has been installed at Dights Falls opening up 120 km of river to migratory species. Catchment area of Melbourne Water Supply. Closed to fishing. No access. No information on fish populations. Flows parallel to the Warburton/Woods Point Highway for 35 km and is very accessible despite steep banks at some localities Flows through forest with clear water and extensive, often turbulent rapids. Channel width is 4-16 m with pools to 170 cm deep. Gravel, rubble and boulder substrate. The river is very small and unsuitable for angling immediately downstream of the Reservoir because of low releases (av. 10 ML/d), but further downstream it becomes larger and is the most productive section of the Yarra for fishing. Angling fish include brown trout to 1.5 kg, (av. 200 g), river blackfish to 400 g, short-finned eel, roach and small redfin. Other species are pouched lamprey, shorthead lamprey, mountain galaxias, rainbow trout, redfin and Australian smelt. A popular area for brown trout fishing is upstream of the Caravan Park at Warburton. Fish can be caught using a variety of fishing methods and much of the river is wadeable. Fishing for river blackfish has improved since 1987. Contains a self-sustaining population of brown trout and is not stocked. The channel in this 14 km length of river is of a similar size to the section above, but with more numerous deep pools. It is very popular with anglers with good numbers of brown trout to 500 g and occasional fish to 1 kg. Access is good. There is rock and gravel substrate from Warburton to Milgrove, then increasing areas of sand substrate. There are some very deep pools at Wesburn and some quite large trout (1+ kg) and abundant roach to 250 g can be taken from this area. Other angling fish are some rainbow trout to 400 g, redfin to 300 g, river blackfish to 900 g and short-finned eel. Other species present are those listed upstream and also eastern gambusia and southern pygmy perch. European carp may be present but are not common. Stocking with trout ceased in 1989 when surveys found that natural spawning maintains the trout population. The area is suitable for all fishing methods and is excellent for fly-fishing during November-December particularly in the early evening. This section has a channel width to 20 m with pools to 260 cm deep. Substrate is mostly sand and there is some bank erosion and sedimentation. Riparian vegetation is often only scattered eucalypts. The River Health Program has seen not only the usual activities of willow and weed control, bed and bank stabilization and fencing and replanting, but there has also been placing of logs in the channel to provide fish habitat and there is a co-operative program with landholders to reduce nutrient input to the river. Access is difficult as the river is 1.5 km from the road and flows through private property. Public access is possible at Woori Yallock and Healesville. The most abundant fish are brown trout to 500 g and roach, with occasional rainbow trout, some redfin, river blackfish and short-finned eels. Other species listed upstream may also occur in this reach. Note that there have been few surveys of this section since 1969 and few angler reports of species caught. A comprehensive survey in 1967 and 1969 found the river at the Maroondah Highway Bridge at Healesville had a lower number of fish than anywhere else in the river. The river flows in a wide flood plain for much of its length with restricted access because of the lack of public roads. River width is up to 25 m with depths to 3 m. Sand is the predominant substrate although there are extensive areas of mud and gravel. River Health Program works are similar to those in the section upstream, but there has also been habitat improvement work for platypus. Downstream to Tarrawarra it contains some brown trout (av.220 g), but mostly roach, redfin and eels. From Tarrawarra to Yarra Glen it is more productive with the same species as above but with a very good population of Macquarie perch downstream of Yarra Glen. These have become established as a self-sustaining population from stocking in the period 1909 to 1927 plus earlier translocation of larger fish. Moderate numbers of European carp are now present. Near Wonga Park and through Warrandyte, the river is deeply entrenched in a steep-sided valley. There are extensive pools to 3 m deep and channel width is up to 34 m. Substrate is largely rock. This is a fairly unproductive section, because of the bedrock, with redfin and roach being the most abundant fish. Some Macquarie perch and Murray cod occur in this area. Fishing through this area is best carried out from the bank or from small, portable boats, because wading is difficult. Flows through a lightly timbered gorge and then an increasingly urban area. Extensive sluggish pools with mud and rock substrate. Major River Health Program works involve improving riparian vegetation and bank stability. Good access at parks and roads. Wading is impossible in most locations because of water depths. Contains redfin, roach, abundant European carp, occasional brown trout and river blackfish. There is a population of Macquarie perch and some Murray cod. Freshwater catfish have been caught at Westerfolds Park and Eltham in the late 1980s. Twenty fish species have been collected in the river from Yarra Glen to Lower Plenty. These include all species listed in the Basin introduction except for Yarra pygmy perch which are now considered extinct in the river and Tasmanian mudfish which only occur downstream of Dights Falls. (Australian grayling and common galaxias have re-entered the river since a fish ladder was installed on Dights Falls by Melbourne Water in 1994). Flows as a wide sluggish river through Melbourne but has parkland along most of its length and is very accessible. Riffles are 40-80 cm deep but predominant water is pools 100-250 cm deep with maximum depths of 350 cm. Rock, gravel and mud substrate. Fish are predominantly redfin to 1 kg, European carp to 5 kg and roach to 300 g. Also some brown trout, goldfish, short-finned eel and golden perch. Fifteen fish species have been collected in recent years. This section has been only occasionally surveyed. A fish ladder was installed at Dights Falls in 1994 resulting in species such as Australian grayling and common galaxias (which had previously vanished from the freshwater section above the Falls), moving upstream into the Yarra River and being recorded in anglers catches as far upstream as Launching Place. Flows sluggishly through Melbourne and into Port Phillip Bay. Freshwater species occurring upstream can be caught below the falls during high river flows. The lower reaches are affected by saline water intrusion from the sea and can contain black bream, sea mullet, flathead, 'pinky' snapper, mulloway to 20 kg, Australian salmon, trevally, and occasionally Australian bass. This latter species is thought to have been illegally stocked, as the accepted southeastern limit of their range is thought to be Wilsons Promontory. This section of the river is under-fished and access is good. Fishing is permitted along the banks through Melbourne City and to the mouth of the river, although there are some restrictions at North Wharf and other wharves. Some good catches of black bream are made at times. Best bait is bass yabbies.